There are no more bullets. All rounds have been fired into head upon head of relentless zombie, including those from your plentiful .22; not like it mattered — the darn reports drew every curious Deadite and the occasional rabbit from miles around. What else to do? Your trusty AR-15 is now your trusty bayonet holder and club. If only you could retrieve your ammo, and perhaps be a bit more silent next time. It won’t be all bullets and blades in the zombie apocalypse. Especially if your country has banned sharp and/or explody things. 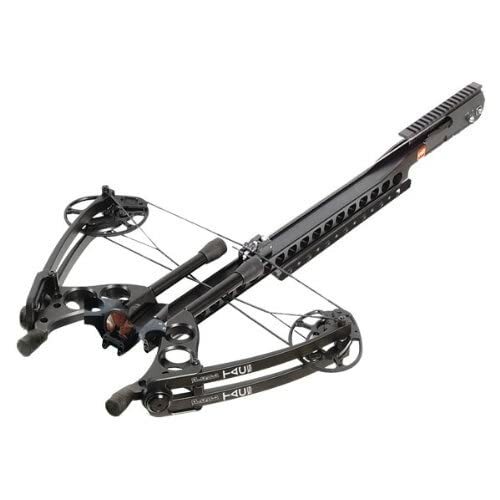 Enter the humble crossbow, modified, re-engineered, and accurate enough for the zombie apocalypse. You won’t want to be swinging that sword or knife the whole apocalypse right? Your arm’s going to get tired pretty quickly. By using arrows and darts, you can retrieve that ammo, wipe off zombie goo and reload. The PSE Tac 15 is that mighty weapon which will enable you to stalk your undead prey in the dark, without risking exposure from brilliant flashes or noisy reports (and yes, suppressed fire is still loud). The Tac 15 attaches to your standard AR-15 lower receiver, and accepts all standard rail mounting hardware. Scopes, stocks, lights, lasers, grips, bipods — you name it. Yes, I sell it here. Click below or visit the Undead Report’s Zombie Hunting Gear Store for the Apocalypse. The PSE Tac-15. Click to buy now! The Tac 15 uses special bolts designed to fly true and accurately, as well as to withstand te immense power coming from this machine. The bolts fly at 412 fps with 160 ft-lbs of kinetic energy. Yeah, you’ll kill more than few zeds with this. Be sure to rinse off those bolts before you use them for game hunting. Tac15.com — the official site of this mean machine. The post PSE Tac 15 Crossbow for Accurate Headshots, Evading Gun Control first appeared at The Undead Report. Huh..a 10 lb crossbow that costs the amount of a real gun and attaches to a gun in the not so reliable Stoner family. Hell, It’s probably worth it. Also- if you get a good suppressor, it isn’t very loud. That’s why they’re called suppressors. Take the M-10’s for instance- It worked so effectively that you only heard the gun cycling. A homeade silencer miight still be loud, but a military grade one isn’t too loud. Looks to be a wonderful little thing to have, although the $1000 price tag might deter someone (me). They should make it so it can attach to more guns, also. I agree Loga, it is kind of heavy, and quite expensive, plus it only fires specifically designed bolts. However, for a long-term weapon, it has many pros, and can work with your existing equipment. Plus, you can stick a grenade launcher on the bottom rail if you have to. I can’t count on two hands how many times I’ve needed a grenade launcher attached to my crossbow. Duct Tape doesn’t cut it. I’m baaack o.O been on a wee lil trip, to where? i’ll leave that to speculation. i actually like this concept, but instead of just a crossbow it would be more “logical” to fuse the two togeather, when your crossbow bolt missed you have a quick follow up with the rifle. (if the bolt hit something solid and made a sound loud enough to grab the attention of the Zack its kinda pointless to stay quite when it already moaned and just alerted the entire group nearby). the 10lbs draw would be enough to punch through the skull, or eye socket, so it wouldnt be a bad weapon, pricey yes, but thats only if you plan to purchase it before the zompocolypse hits, im sure you could find this in most sport stores when your scavanging for supplies or other survivors. if id give it a rateing mostly on concept of the idea id give it a 7/10, mainly because if or when your bolt on your AR-15 or any of its cousins break (ex: firing pin, chips in the star cluster, or just wear and tear) it would be something you can fall back on knowing you dont need to abandon the entire weapon, just swap the top reciever untill you can either find a replacement or you have the time to repair it yourself. Well, I am new to this site, but I must say that the “cross bow” thing is not my bag. Nice concept and pretty smart to put two different weapons together like that. Arrows take up more room than regular ammo and I’m pretty sure I can’t carry 500 arrows around as easily as I could, let say 22 long rifle.